Since 1994 Robert Sheena has been the principal English horn player for the Boston Symphony Orchestra (BSO) and Boston Pops Orchestra (BPO). As a result of his mastery of his instrument, Mr. Sheena has been honored with several premieres and appearances as soloist with the BSO/BPO and has received much critical and audience acclaim. At Tanglewood in 1996 he was a featured soloist with the BSO in Andre Previn's Reflections for English horn, cello, and chamber orchestra. In 1999 he performed the solo English horn in Sibelius's Swan of Tuonela with the BSO in Symphony Hall, and on Opening Night at Tanglewood in 2000 he was a soloist, with then-principal trumpet Charles Schlueter, with the BSO in Aaron Copland's Quiet City, a work he has also performed with the BPO. In 1998 David Alan Miller and the Albany Symphony commissioned a work for English horn and orchestra, Gabriel Gould's Watercolors, expressly for Mr. Sheena, who premiered and later recorded the piece with that orchestra under Mr. Miller's direction. He gave the premiere of Dan Pinkham's Odes for English horn and Organ at the American Guild of Organists convention in 1998. 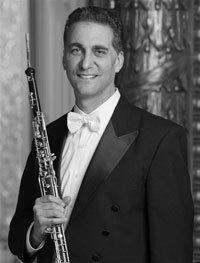 As a teacher of oboe and English horn, Mr. Sheena is currently on the faculties of Boston University, the Boston Conservatory, and the Longy School of Music. An alumnus of the Tanglewood Music Center, he now works with TMC Fellows in chamber music coachings and master classes at Tanglewood. Along with BSO principal oboe John Ferrillo, he co-directs an intensive two-week summer workshop for young oboists at the Boston University Tanglewood Institute. Prior to joining the BSO Mr. Sheena performed frequently as an extra with the Chicago Symphony Orchestra. From 1987 to 1991 he was assistant principal oboe and solo English horn with the Hong Kong Philharmonic Orchestra and with the San Antonio Symphony from 1991 to 1994. He received his bachelor of music degree from the University of California at Berkeley and his master of music degree from Northwestern University. He has studied the oboe intensively with such masters of the instrument as Ray Still, Grover Schiltz, William Banovetz, John Mack and Marc Lifschey.